The idea behind data driven marketing is that the data registered by POS and the eShop contain valuable information which allows you to predict customer responses to a specific marketing offer. 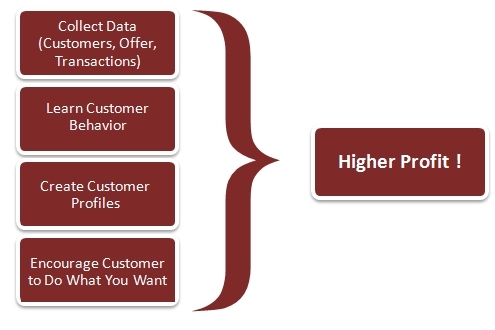 If you combine your sales transaction data (date and time of purchase, store location, price, discount, consumer/discount card) with a product characteristic (product category, price, brand, fabric, color etc) you can analyze a consumers’ activity and create behavior profiles. You then continue to follow up consumers’ activity and, at the time they are willing to buy, you send them an offer they are likely to accept, spending their money in your store rather than visiting a competitor and purchasing there. Do you measure which ad generates more long term profit? Have you given-up sending catalogues because it is not cost effective? Find out when to send catalogue and which customer segment to target. Argo Team can help you create Trip-Wire anti-defection campaign sending special offer emails to defecting customers.